I’m not afraid to say that I am a fan of gimmicks. There’s an added element of fun when an action figure can do something more than to be placed into different poses. Whether it’s light-up, projectile firing, water squirting, spring-loaded punching, color-changing or limb-swapping, I’m down for all of it. Other than the Lunartix aliens and the monumentally unusable Golobulus, I can’t recall other Joe figures with bendy appendages (is there a term for that? If not, I’ll call it Gumbified.) When a feature works, and it integrates with a figure to create more play value, a gimmick is a wonderful thing. When it fails, the figure earns itself a one-way ticket to the Island of Misfit Toys. Coil Crusher takes the Valor vs Venom concept of combining human and animal DNA to its most symbolic conclusion. He’s a human and snake hybrid. Great idea; less than great execution. The arms are so short, they can’t be effectively used for their purpose: to bend around enemies to simulate a crushing grip. Instead, they just sort of, well–bend. Barely. There was also a 12 inch version of Coil Crusher, and in an odd turn, it was later reused for the Rise of Cobra 12 inch Neo Viper. Both were Gumbified. I like the Coil Crusher concept, and the design is solid. 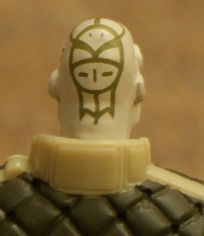 I really dig the funky head marking and wonder if it’s supposed to be a tattoo or natural marking. The file card does a great job of pointing out all of his snaky attributes (he has nictating membranes!) and I appreciate the overall attempt here. While I find it to be an interesting figure and indicative of the more super-heroic looks of the era, the character could have benefited from being redone in the construction and style of later excellent Valor vs Venom figures like Croc Master. Coil Crusher is light on accessories, with only a single rifle and a Gumbified snake companion, which although bendable, is ultimately useless other than to lie on its side. An homage to Golobulus? Funny how you mention Golobulous throughout this entire thing–tomorrow I ought to see if I can pick a complete one up at my Local Flea Market. You mean Sqeeeeeeze of the Snake Men? I like him, he looks cool and the bendy arms are something different. Golobulus……ugh…..just terrible. I did a post “Golobulus vs. Discobulous” and trying to get that piece of plastic to pose for pictures was excruciating!! Awful figure, but I may pick up this guy just to play.with his arms! I love this character, it’s always had a place in my verse since I first got the figure. He even found his way in to my Sigma 6 universe. Last month I commissioned another customizer to make one for me because my modern Cobra forces are incomplete without a Coil Crusher as the big hulking enforcer. Rob, this is a gimmick I agree with on: awesome idea, less than awesome results. But I still dig it.